There are lots of data analysis and visualization tools out there, but the most commonly used (and misused) has to be Excel. It’s certainly not the best, but in terms of sheer number of users, I have a hard time imagining any other tool with more. I’ve found that many data discovery efforts include Excel at some point or another in the process. If you are interested in getting better at Excel, I highly recommend you follow Jon Peltier, Jorge Camoes and Chandoo. These three guys are the Excel pros, and much of what I have learned over the past few years has come from them. I haven’t featured any Excel dashboards on this blog thus far, but thanks to a recent contest at Chandoo.org, I found myself cranking out the old pivot tables and vlookup formulas to see what I could do with a provided data set of 1,883 responses to a recent salary survey. Well I have to admit, after a solid year of using mostly Tableau to explore data sets, staying in Excel felt a little like speaking a foreign language. Many times I found myself struggling to do something that would have been second nature in Tableau. I think a huge part of that is the difference in the tools themselves (Tableau is designed specifically for data discovery via visualization), but certainly part of it had to be the user as well – I just haven’t been spending that much time in Excel doing this type of activity lately. And what was the end result? The last bullet point – “slicers” is the most powerful part of the worksheet, and only available (I believe) in Excel 2010. Slicers are cool because they allow the user of the worksheet to drill down to any combination of response attributes. They’re basically like “Quick Filters” in Tableau. An added bell (or whistle if you prefer) is that the country tables include a flag to the left of the country name that changes to match the corresponding country when the slicer filters are applied. “Ooo, fancy!” Hey, thanks! To try it out for yourself, just download the worksheet, open it with Excel 2010, and click on any of the colored pills in the section to the lower right under the “Global Filters” header (you can hold down Ctrl to select multiple attributes and press Alt + C or click the little icon in the upper right of the pill grouping to clear the filter). You have to be careful because many of the countries only have a single survey respondent, making average “mean”ingless (sorry). This often happens with survey response data – people make all kinds of conclusions based on very small sample sizes. While I went ahead and ranked the countries based on mean anyhow, I included the all-important “n” column in the table to flag the user. I stopped short of doing any tests for statistical significance, but this could have been done as well. I also added the “region” field, which wasn’t included in the original data set at all. I was able to obtain these region categories from the UN stats website. It sounds easy enough, but believe me, it was a pain (‘Vietnam’ vs. ‘Viet Nam’ is one example of many mismatches that had to be manually adjusted). Summary statistics – these cells are pointed to the grand total row of a simple pivot table. Nothing fancy here. I added it because it really highlights the “big picture” for the user, before they get into the details below. Top & Bottom 5 lists – same thing for the tables themselves, the cells are pointed to two different pivot tables, the first of which is sorted based on descending average salary (so the best are at the top), and the second of which is sorted based on ascending average salary (so the worst are at the top). Two-country comparison – this section makes use of two data validation cells that allow the user to pick two countries from a drop-down list in a separate worksheet tab. The list is generated from the country name column of yet another pivot table. Updating flags – This was the trickiest part to do. Its hard to explain, so I will refer you to this post or this video. Basically, you create a second table in a different worksheet with the country names and the respective flag images fitted to the adjacent cells, name the cells (Ctrl+Shift+F3), create special formulas (Ctrl+F3) using the =INDIRECT() function, and map each image in the worksheet to the right formula. The four column charts in the lower section each have their own pivot table (there must be a more efficient way to do this – suggestions are welcome!) and the error bars are added using the ‘Layout > Error Bars > More Error Bars Options’ path and selecting the custom error bars option and pointing it to a pivot table with standard deviations for each of the four attributes (region, experience, job and usage). More on error bars at Jon’s site here. Slicers: a great tutorial that Chandoo created to teach about slicers can be found here. This part really wasn’t that difficult, you just have to know to include slicers using the ‘Analyze > Include Slicer’ menu path, and to connect each slicer to all of the pivot tables in the document so that they act as global filters. What’s your take? What would you do differently with this specific project? How much do you use Excel? I’d be interested in hearing your thoughts about the use of Excel, PowerPoint, and Tableau for interactive reporting. Zach – first, wow! I like Slice, and the version of the worksheet you created is pretty cool. More than anything, it’s interactive via a web browser. My Excel worksheet, on the other hand, is NOT, so I declare you the winner! 🙂 Second, I’d love to chat – I have a great many thoughts about interactive reporting and the different tools that are involved. Thanks for taking the time to create a version in Slice and leave a comment. But the main reason I’m posting is to say thanks for mentioning “(Ctrl+Shift+F3)” which I had no idea about and is just super useful for me! Anyway, good luck in the contest. Hi 5antiango – thanks for the positive feedback, and I’m glad you found the keystroke shortcut helpful! It’s funny how sometimes the little things can make a big difference, isn’t it? I remember when someone showed me the F4 shortcut to change from =A1 to =$A$1 in a formula. It was like cubical Christmas day or something. Sounds good, but is impossible to see fully in Mac: the workbook contains features that are not supported on Excel 2011 for Mac: data segmentation. Hi Pedro – good to know! I’ve never used Excel on a Mac, but it seems like you are right, the “Slicers” feature in Excel 2010 for Windows is not included in Excel 2011 for Mac: http://www.macworld.com/article/1155113/excel2011faq.html. Thanks for bringing this to my attention. That’s too bad, I’ve found the Slicers feature to be helpful. Hopefully it will be included in future versions of Excel for Mac. Hey Ben – Nice work on the dashboard. Its been a while since the contest ended, but I thought I’d let you know I was disappointed that your entry did not make the top three. It was far superior to a couple that made it in my opinion. Hi Joey – thanks very much for the kind words! I figured I had a decent chance, but had to settle for honorable mention. 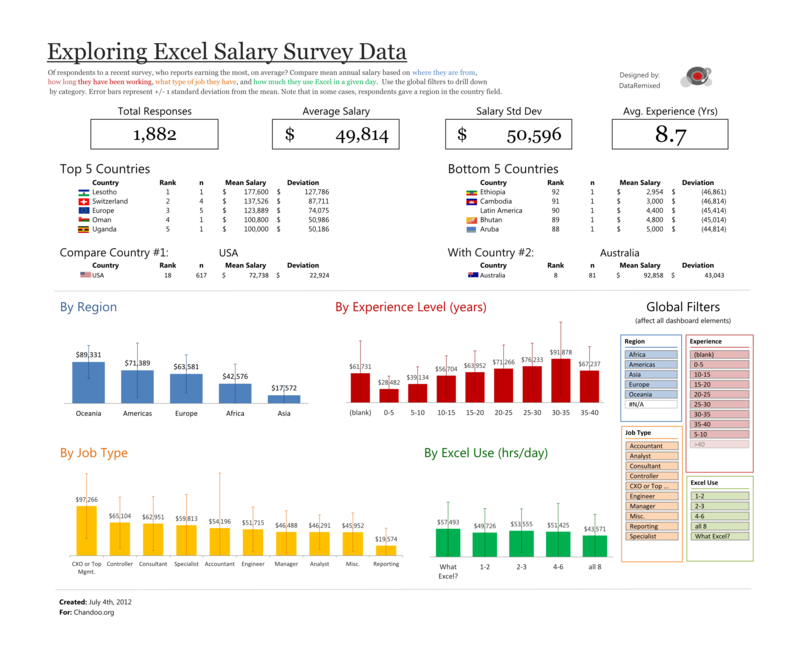 It was a good exercise in dashboard building with excel though – something I haven’t done since I discovered Tableau. do you have any idea how to add timestamp to excel survey in skydrive , the way it automatically happens in google drive? Hi Karam – no, sorry, I’ve never used SkyDrive so I don’t know. I just bumped into this page, so eager to wanna try on the slice. Bbtw, the mentioned excel file at “Here is my final submission. You can download the Excel file here (692KB):” is no longer available. I might be very late, but is there any way I can get hold of the file? Hi Elsa, does this link work for you?